The Gaming Control Board for Nevada released a financial report on Tuesday, the 31st of January 2017. The report included the fiscal figures for the final quarter of 2016 along with the annual numbers for the year. According to the report, the casinos in Nevada have collectively shown a growth in revenues compared to the year before. There are 327 licenced gambling venues scattered across the state of Nevada. According to the Nevada Gaming Control Board’s report, together they earned USD 11.26 billion in revenues. This showed a year over year gain of 1.28 per cent. The casinos collected USD 142 million more in 2016 than they had done in the calendar year before. Gambling wins for the Nevada casinos have been on the rise in recent years. In six out of the last seven years, the state’s casinos have reported overall year over year growths in revenues. However, they have failed the break the record that was set before the Great Recession weakened the state’s casino market. In 2007, the Gaming Control Board reported collective gaming revenues of USD 12.8 billion. Compared to the previous year, Slot revenues were also up in 2016. Slot machine revenues, unsurprisingly, were responsible for the major share of profits. Income from slot machines accounted for 64.3 per cent of the annual casino revenues. In 2016, there were 145,813 licensed slot machines in operation across the state. They collectively reported earnings of USD 7.16 million; a 2.28 per cent year over year increase compared to the same timeframe of the previous year. In 2015 slot machine revenues were reported at USD 7.00 million. However to everyone’s surprise, these slot machine revenues were not exclusively driven by Las Vegas Strip casinos. Much of these profits came from slot machines that are housed in casinos that are outside of this area, scattered all across the state. Mike Lawton, a Senior Analyst with the Nevada Gaming Control Board, explained that this was a good trend for the state. He also explained that these results suggest that the gambling industry is growing all across the state of Nevada and not just the Las Vegas Strip area. Collective table games revenues showed negative growth in the year of 2016. There are 5,881 licensed table games across the casinos in Nevada. They took in USD 4.09 million in revenues over the 12 months of 2016. This reflected a 0.40 per cent year over year decline in profits compared to the year of 2015. Annual table game collection for 2015 was reported at USD 4.11 million. Nevada casinos collectively won USD 1.2 billion from baccarat in 2016. This was however down compared to 2015. The figure showed a 5.3 per cent year over year decline. Lawton also mentioned that over the last three years, less money has been spent on baccarat. The statewide increases in revenues have come despite that. Baccarat is a high- stakes game that is favoured by high- rollers, mainly from Asian countries and communities. Clark County of Nevada was established in 1909. It is the most populous county in the state. Nearly three- quarters of the state’s residents live in this area. There are 164 licensed gambling venues under this county’s jurisdiction. Most of them are licensed to offer both slot machines are table games. The popular gaming areas of the Las Vegas Strip, Downtown Las Vegas, North Las Vegas, the Laughlin Area and the Mesquite Area all fall within the borders of this county. A total of USD 9.7 billion was reported in revenue for this area in 2016. This marked a 1 per cent year over year growth for the county; they collected USD 96.26 million more than reported figures for 2015. Slot machine revenues for Clark County were reported at USD 5.9 billion for the year of 2016. This also marked an increase in revenues, of USD 117.92 million, compared to 2015; a year over year increase of 2.04 per cent compared to the previous year. Table game revenues unfortunately were not as favourable. They collected USD 3.82 billion from table game players over the course of 2016. This marked a 0.56 per cent year over year drop compared to 2015; a loss of USD 21.67 million. The Las Vegas Strip is the 4.2 mile stretch of the Las Vegas Boulevard South, which is known for its concentration of resort hotels and casinos. While the strip has an iconic relation with the city of Las Vegas itself, it is actually located south of the city limits. 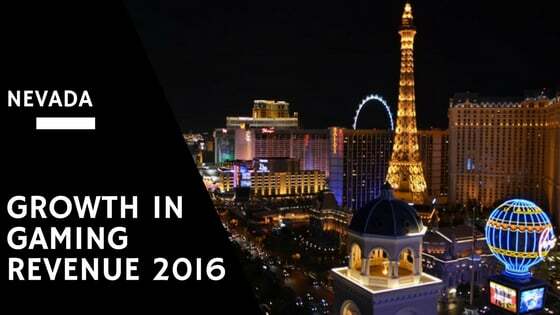 There were 40 licensed gambling venues in operation on the Strip in 2016. It is considered the largest gambling centre in the state of Nevada. Total revenues for the Las Vegas Strip in 2016 were reported at USD 6.38 million. This marked a 0.44 per cent year over year gain compared to the calendar year of 2015. Slot revenues, surprisingly, were responsible for less than half of the sum. There are 40,745 licensed slot machines on the Strip. Slot machine revenues for 2016 were reported at USD 3.12 million. However, this still marked a 1.98 per cent year over year growth compared to the previous year. Table game revenues were reported at USD 3.25 million. This marked a year over year decline of 0.99 per cent. There were 3,020 licensed table games operation in the area last year. Downtown Las Vegas is the central business district of Las Vegas and was the original gambling district of the city. It is located just north of the Las Vegas Strip. The area still maintains 20 casinos amongst a variety of hotel and business high rises, cultural centres, historical buildings, government institutions, residential and retail developments. In 2016, the casinos in the area reported total revenues of USD 565 million. This marked a 4.2 per cent year over year growth compared to the previous calendar year. Slot machine revenues were responsible for most of that sum. A total of USD 400.7 million was collected from slot machines in 2016 in the Downtown Las Vegas area. This marked a 3.44 per cent year over year revenue growth compared to the year before. According to the gaming control board’s report, there were 9,802 slot machines in operation in the area in 2016. Table games too were on the rise in Downtown Las Vegas. There are 426 licenced table games in the area, which collected USD 163.9 million over the course of 2016. This reflected a 6.15 per cent year over year growth compared to the year of 2015. Boulder Strip is another gaming market in the Clark County region of Las Vegas. It has been named after the Boulder Highway that brings in all the traffic into the area. There are 32 gambling venues located in the area; all of them offer slot machine services, while only 19 of them offer table games. The casinos in the area collected a total of USD 788 million in revenues over the course of the year 2016. This marked a small 0.46 per cent year over year growth in revenues compared to the year before. The casinos in the area, which house 18,466 slot machines, reported slot machine earnings of USD 693 million for 2016. This marked a 1.19 per cent year over year growth compared to the prior year. Slot revenues accounted for 88 per cent of the casino income in the Boulder Strip region. Table games on the other hand reported less than favourable fiscal figures. The casinos in the area collected USD 94 million in table game revenues. This marked a 4.53 per cent year over year decline compared to the year before. In 2016, 331 table games were in operation in the area. Washoe County, which lies along the western border of the state of Nevada is the second most populous county in the state. The largest city in the county is Reno. It also includes the Sparks area and the North Shore Lake Tahoe Area within its borders. A total of USD 810 million was reported in revenue for the county in 2016. This reflected a 4.28 per cent year over year growth compared to the year before. The casinos in the county collected a total of USD 33.2 million more in 2016 than they had done over the course of 2015. Slot machine revenues were reported at USD 657 million for 2016 for the area. This marked a year over year increase of 5.32 per cent, which also means that the casinos collected USD 33.2 million more over the months of 2016. Table game revenues remained more or less unchanged. They collected USD 153 million in table game revenues over the course of 2016. This reflected a mere 0.02 per cent year over year growth from the year before. Reno City, located approximately 36 miles from Lake Tahoe is known as “The Biggest Little City in the World.” Reno is the birthplace of Caesars Entertainment Corporation and has a total of 20 casinos located within the city boundaries. Out of which, 17 of them offer slot machine games and 11 of them offer table games and sportsbook services. Reno casinos recorded a total win of USD 596 million over the course of 2016. This marked a 4.5 per cent year over year increase compared to the previous calendar year. The Carson Valley gaming area consists of nine casinos, all of which are small compared to the ones located elsewhere in the state, such as the Strip or Reno. The properties reported annual revenues of USD 100.4 million for 2016. They showed a loss of USD 187,162 compared to the year before, which also reflected a small year over year loss of 0.19 per cent. Carson Valley was the only major area in the state with an overall year over year loss. Slot machine revenues for the area were reported at USD 94.7 million. This was USD 653,946 more than the year before. The increase in profit marked a year over year gain of 0.70 per cent. Table games were the reason behind the overall year over year loss the casinos suffered in the Carson Valley area. For the year of 2016, the total revenues reported for table games in the area were USD 5.7 million. This marked a USD 841,108 loss in revenues compared to the previous year, which was also calculated to represent a 12.89 per cent year over year loss. Elko County is the fourth largest county in the United States, not counting Alaska. Elko County, which is part of the Elko, NV Micro-politan Area houses 25 gambling venues, all of which offer slot machine games, while only 11 of them offer table and other gaming services. Total gaming revenues for the area in 2016 were reported at USD 269 million. This marked a gain of USD 2.8 million, also a year over year gain of 1.05 per cent compared to the year before. Slot revenues were responsible for the major bulk of the earnings for the county. The casinos reported slot machine revenues of USD 219.2 million for the year of 2016, a USD 2 million increase in profits compared to the year before. This also marked a 0.93 per cent year over year gain in slot machine revenues. Table games brought in revenues of USD 49.5 million in the Elko area in 2016. This showed a USD 774,283 increase in revenues compared to the year before; which also reflected a year over year gain of 1.59 per cent. Several other gambling properties are scattered elsewhere across the state of Nevada. These properties collectively reported revenues of USD 148.3 million over the course of 2016. They took in USD 453,334 less than the year before. This also marked a 0.30 per cent year over year drop in revenues compared to the previous year. Slot revenues from these casinos saw a drop in 2016 compared to the previous year. They collected a total of USD 144.4 million over the course of the year, which was USD 800,897 less than the year before. This marked a 0.55 per cent year over year decline in slot machine earnings compared to that of 2015. Table games, on the other hand, reported favourable figures. Revenues from table games were reported at USD 3.9 million; a 9.90 per cent year over year increase from the year before. They collected USD 347,563 more over the 12 months of 2016 than the previous year. A major proportion of the Nevada General State fund comes from the gambling industry. It has been reported that around 45 per cent of the state’s tax fund is sourced from casinon related businesses. As a result, unlike the residents and business owners of many other states, those in Nevada do not have to worry about many taxes, such as personal income tax, corporate income tax, sales tax on food and several more. In 2016, the collective taxes paid by the casinons in the state was USD 879.3 million. While the state of Nevada has seen small ups and downs in their casino performances over the last few years, the industry is still far from the days that prevailed before the recession. However, the gaming board is positive about the prospects of continued growth in the state and the industry. Lawton, the analyst at the Nevada Gaming Control Board, said that the board anticipated that factors including higher wages, increased employment and more Nevada visitors will lead to continued revenue gains in 2017. “We are pretty optimistic,” he said.